Here's a really simple recipe that's quick to throw together for a weeknight meal. It's perfect for the cooking novice because you really don't even need any experience. You just layer your ingredients, and then bake it! See? Easy! TBH, I have no idea where I found this recipe. Hmm... come to think of it, I've said that a lot lately, haven't I? Well, what can I say? I'm always seeing recipes and then setting them aside for another time until I finally get around to trying them. I guess, with this one, I saved the recipe, but forgot to note where I got it. Oh, well, I'm sure whoever came up with it won't mind that I'm sharing it. It's absolutely a "how can this not be good?" recipe. Delicious and hearty and always hits the spot! Serious yum. Preheat your oven to 375 °F. Lightly grease a 8" x 8" casserole pan. Add the biscuits dough pieces to the casserole. Add the tomato sauce, spreading it evenly over the biscuits pieces and saving 1/2 cup for later. Place the tomato slices and 1/2 the pepperoni evenly on top and sprinkle the leftover tomato sauce. Add the basil leaves. Add the mozzarella cheese and top with the Parmesan cheese and remaining pepperoni. 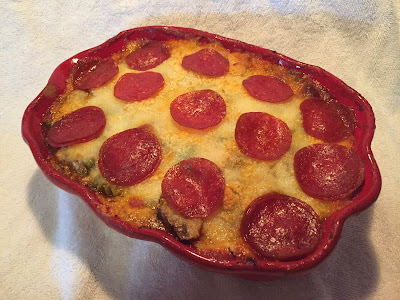 Bake your casserole for 20-25 minutes or until the cheese is bubbly and golden brown. Switch up the ingredients! Sauteed onions, mushrooms, peppers, sausage, even ham and pineapple! Add whatever pizza toppings you like! Feeding a crowd? Double everything and bake it in a 9x13 pan! To turn regular marinara sauce into pizza sauce, just add a few shakes of dried oregano. Boom! Pizza sauce!